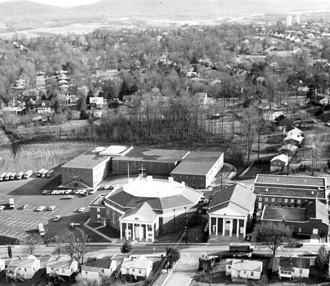 This aerial photo from the 1970's shows the original Thomas Road Baptist Church and its adjoining facilities. Liberty University Chancellor Jerry Falwell, Jr. announced in convocation Wednesday morning that LU’s Board of Trustees had recently voted to purchase the old Thomas Road Baptist Church property with intentions of establishing a new campus for Liberty Baptist Theological Seminary. 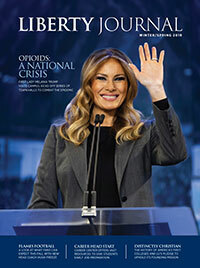 It will also bring Liberty “full circle,” Falwell said, explaining that the church provided Liberty with a firm foundation to grow from, serving as a laboratory for LU students studying to become pastors and church leaders. With the seminary tripling in size in just five years, he said the move was practical — with 200,000 square feet and state-of-the art facilities at the original site. “But the move also has a spiritual dimension,” he said. “We are going to send out thousands of ministers from the location where it all began.” (See Caner’s full statement on the move below). Just before Chancellor Falwell introduced his brother, the Rev. Jonathan Falwell, TRBC’s senior pastor, as the convocation speaker, he gave a brief history of the relationship between TRBC and Liberty. He recalled as an 8-year-old hearing his father, the late Dr. Jerry Falwell, first announce at the church that he was starting a college. And soon the nation was hearing the news through Thomas Road’s Old Time Gospel Hour television broadcast. “In 1989, Dad reached the conclusion that he could have a permanent impact for Christ on the world by transforming Liberty into a world-class university that would train Champions for Christ long after his life had ended,” Chancellor Falwell said. It was at this time that Falwell, Sr. moved his offices from TRBC to LU. Even as Liberty became Falwell, Sr.’s primary focus during the last 17 years of his life, Chancellor Falwell said, he never stopped being a pastor at TRBC and it was his goal that TRBC and LU would always remain connected; moving the church next door to Liberty in 2006 was a key part of that plan. And all the while his father juggled both roles — days, nights and weekends. But after his death in May 2007, “neither my brother nor I had any desire to keep up that pace. God had called Jonathan to be a pastor and had prepared me for the role I am serving here,” Chancellor Falwell said. “I cannot begin to tell you how excited I am about this move. In a very real sense, the Liberty Baptist Theological Seminary (LBTS) is going ‘back to Bethel.’ In Genesis 35:1-3, God called Jacob to return to the site of his original fire. It was the location of his vows before God, years before, in Genesis 28: 18-22. Chancellor Falwell has given us an unprecedented opportunity to return to the birthplace of Thomas Road Baptist Church and Liberty University. The original flame, where God sparked a vision in the heart of our founder, Jerry Falwell Sr., is sacred ground to us. Our commission as a Seminary is clear – we must continue to fan the flame, and we are going to be blessed to do it at the original point of contact. Tens of thousands of souls were saved there. Now, thousands of ministers shall be launched from there. Practically, this is a blessing beyond our dreams. With over 200,000 square feet and state-of-the art facilities at the original site, the seminary and the other ministries that are moving have been given an incredible gift. The Chancellor has given us this great opportunity, which is also a great responsibility. The Chancellor and I have met continuously over the past months, and the remodeling of the facility to house the Seminary is breath-taking. The plans are formidable, but so is our challenge. Pastor Jonathan Falwell has called us to plant 5,000 churches in the next decade, and we are already well on our way. Chancellor Jerry Falwell, Jr. has commissioned us to historic growth, and we are already triple the size we were just five years ago. This move was practical in nature: we are out of room! But the move also has a spiritual dimension: we are going to send out thousands of ministers from the location where it all began.